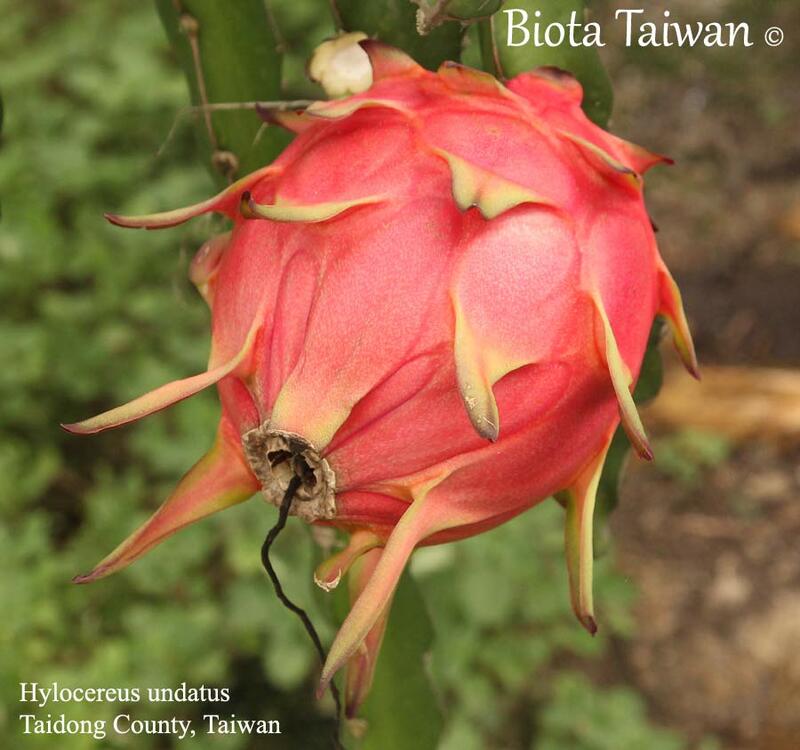 There are other species of Hylocereus in Taiwan, many of which can be very difficult to differentiate. 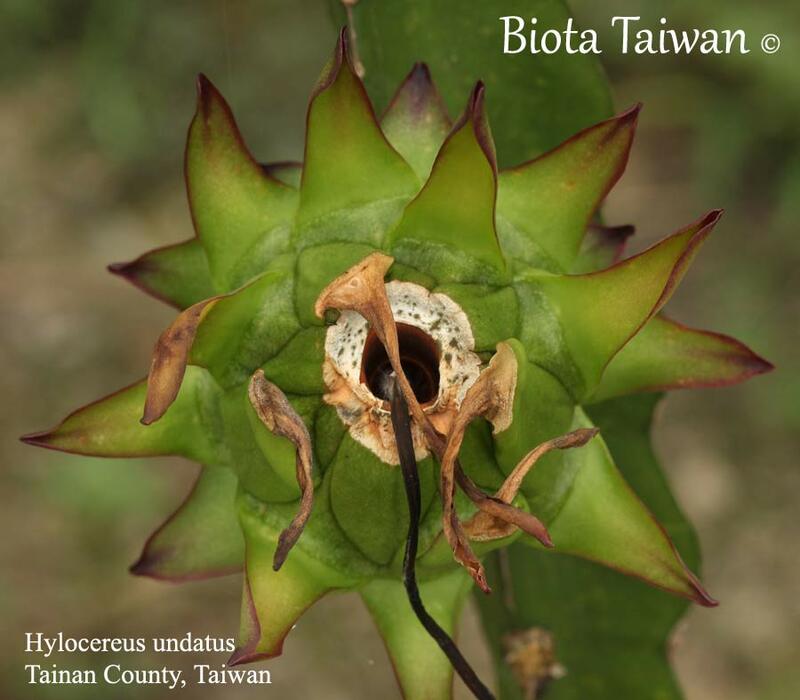 Taiwan also has a lot of commercial development which includes selective breeding and hybridizing with other Hylocereus, including with another genus: Selenicereus. Hylocereus, as a genus, tend to be tropical vine type cacti. H. undatus is a climbing cactus vine that uses its aerial roots to attach itself to trees, rocks and other surfaces where it will climb to better light for reproduction (flowering is induced via photoperiod). Due to this, Hylocereus undatus in Taiwan is usually, though not always, confined to more open, sunny areas. Hylocereus undatus is cold sensitive and will not tolerate freezing temperatures or cold temperatures in wet conditions, so they should be found consistently from sea level to mid eleveation. Exact elevations will depend on exact locality as the limiting factor will usually be temperature and competition from other plants. Dragon fruit is mostly cultivated commercially in lower elevations and the flat lands of eastern and western Taiwan. Hylocereus undatus is not a native species, does not tend to be a bad vector for plant pathogens and is not invasive in habit (although it may be considered naturalized in Taiwan now). For these reasons there seems little concern over this species. The biggest environmental impact of dragon fruit in Taiwan is the low quality of farming systems utilized within Taiwan, and thus there will be many environmental impacts through poor agricultural practices. Dragon fruit is an important commercial crop for Taiwan, producing both white and red fleshed fruits. Many more varieties are being selected and yellow skinned hybrids with Selenicereus are also being developed. 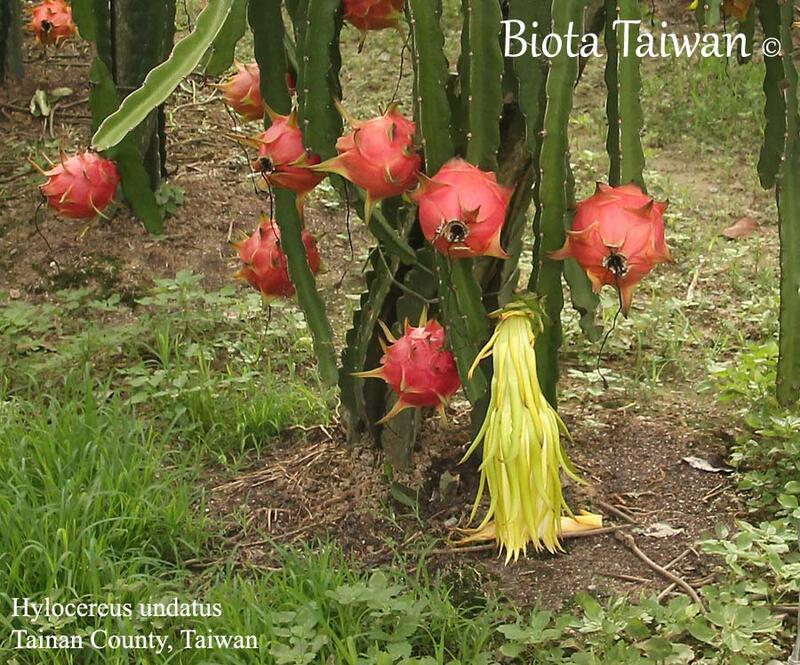 At the time of this writing, Taiwan has begun opening exports of dragon fruit to more countries, and local farmers have already started planting quite a lot more fields with this cactus fruit crop. Tolerates floods if in open area that dries soon after the rains stop. Tolerant of droughts. Does not tolerate freezing temperatures or near freezing temperatures, especially if moist or wet. Most commercial growers in Taiwan use post style or fence style cultivation methods. Dragon fruit flowering is triggered by photoperiod, day length. Artifical lighting systems are in place to increase production, but they are very innefficient at this time in their use of resources. See side bar to the right side of this page for all the photos. Hylocereus undatus fruit with wilting flower. Hylocereus undatus immature fruit with flower fallen off.